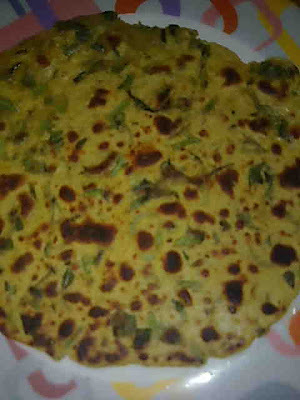 Palak paratha is a good combination of taste and health. It's one more way of eating palak. You can also add a pinch of turmeric powder to the dough to give it a nice yellow color which is very appealing. Don't knead the dough of palak paratha too well in advance. Otherwise palak will leave water and dough will be a bit difficult to manage. 1. Cut stems of palak leaves and discard. Wash palak leaves thoroughly in running water. Chop finely. 2. Put palak in a big bowl and mix all ingredients except atta and oil. Add atta and mix. 3. Slowly add just enough water so as to make pliable dough. Rest the dough for 15 minutes. 4. Take a ball (peda) out of the dough and roll out like a roti. 5. Heat a tawa (griddle) and cook parathas on both sides brushing with oil. Cook on medium heat till golden brown. Serve hot palak paratha with some pickle.